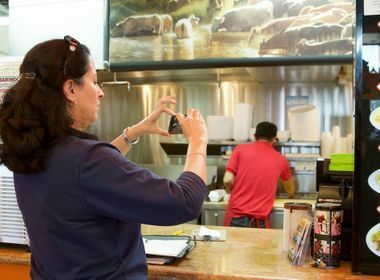 Betty Porto, daughter of Porto's Bakery & Cafe founder Rosa Porto, at the company's Downey location. Betty Porto (right) with her niece Arianna. Arianna Porto grew up in the Porto's Glendale bakery. In the next two years, Porto’s Bakery & Cafe plans to expand to Buena Park and West Covina. Betty Porto (left) with Sherri Lewis, SCE account manager. Porto’s has saved 15,000 kilowatt-hours each year at its Downey location by taking advantage of the Savings By Design program. Porto's Bakery & Cafe in Downey. Porto’s Bakery has been a mainstay in Southern California since the 1970s. 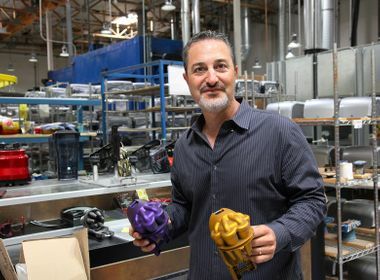 With the help of SCE, the business has improved its energy-efficiency savings. Conventional wisdom says a busy restaurant is a good restaurant, and an empty restaurant is probably empty for a reason. Porto’s Bakery & Cafe — with locations in Glendale, Burbank and Downey — has lines out the door almost all day long. “It’s like this pretty much all the time,” said Betty Porto, daughter of bakery founder Rosa Porto, on a recent visit to the Downey location. The Porto family immigrated to Los Angeles from Cuba in the 1970s. The family’s success story began out of necessity — both Rosa and her husband, Raul, lost their jobs when they requested emigration to the U.S. Baking cakes out of their home allowed the family to persevere while their emigration request was processed. When the family finally landed in Los Angeles, Rosa was amazed to find that her reputation as a baker had preceded her with the local Cuban community. The first expansion of Porto’s Bakery was to a tiny shop in Echo Park. Then, when demand continued to increase, the bakery moved to Glendale in 1980. Rosa’s basic offerings were traditional Cuban cakes and pastries, but customers began asking for treats from other traditions. The business adapted, including French mousses and guava and cheese strudels, in addition to their signature potato balls and cheese rolls. The Glendale bakery soon expanded and then a second bakery was launched in Burbank in 2006. A third bakery was opened in Downey in 2010. By taking advantage of Southern California Edison’s Savings By Design program — which supplies energy-efficiency expertise to new commercial construction projects — Porto’s has seen significant savings at its Downey location. Each year, the business has saved 15,000 kilowatt-hours. “It has been a pleasure working with Porto’s as they are always willing to engage with me to explore new opportunities with SCE programs and services,” said Sherri Lewis, SCE account manager. After graduating from college, Betty and her siblings, Raul Jr. and Margarita, decided to stay with the family business, each taking on specific roles. Raul Jr. focused on new product development, production improvements and quality control. Margarita joined her mom in the cake decorating area; Betty worked with her father serving customers. In 2005, with the business in the capable hands of the second generation, Rosa and Raul retired. Now, a third generation is preparing to take the business to new successes. Betty’s niece, Arianna, recently completed her studies at the prestigious Culinary Institute of America. The family has been approached by investors seeking to franchise the business, but so far Porto’s has declined. The recipe is working, with plans to open two more Porto’s Bakeries in Buena Park and West Covina in the next two years. “Even though we have over 800 employees, we still see ourselves as a family business,” said Arianna.